There's always something new to discover in the Strip District. Today it was a remodeled Cafe Raymond, which inspired an afternoon tour of local businesses. I was wandering intentionally and somewhat briskly toward lunch after successfully helping my CPR class rescue ten mannequins, and each other, from imaginary emergency scenarios. More confident in the Red Cross and my resuscitation skills, I am marvelously alone. A fifty-percent-off sidewalk sale catches me by the bookstore, where I invest in a 2018 calendar. Its bird theme reminds me of a friend recommending the Audubon Society’s Christmas bird count, and I wonder if my husband would enjoy participating this year. The sky is blue and the temperature pleasant. I could advance deeper into the Strip’s restaurant options, but something calls out to me as I pass the door of Cafe Raymond—perhaps memory, perhaps part of the future. The line is only two people deep, so I venture inside. Last time I was here was maybe the spring of 2010, the same day I found my wedding dress with my mom and sister at Carlisle’s, the corner building on 26th Street, which is fittingly now a restaurant, plus Whirl Magazine's headquarters. We must face this: it's easier to plan a meal together than it is to plan a life (and more economic for city realtors and landlords, maybe, but that's another topic). The Frenchness of Cafe Raymond had caused me to recommend it to my mother. Today it has more of a bistro feel, which is fine. It’s still busy, but not too busy, even after the noon influx. The spacious dining area extends past the open kitchen; the counter now faces east instead of south. I feel like Joanna Gaines would enjoy its wooden base and the soft track lighting above, but I don't know if she'll visit this part of the country. Nevertheless, European and American menu options abound. My conversion to veganism not yet complete, I’m tempted by the jambon and brie baguette and the classic burger but opt for the veggie muffaletta when it’s my turn to order. I sit across from the Pepsi-Cola cooler with my table number’s metal stand in hand, enjoying a bottle of water. The cashier offered “free water” too, but with the city lead scare I feel wary. Waiting for my portobello and squash on focaccia, I recall a man who said last year he sold filtered water in his neighborhood, and I wonder when and if similar ventures will pop up again. Any investors want to get on board? Put it on the list with an urban greenhouse: can we grow our own spinach? Think of the health and sustainability factors. Why rely on California? Can't more Pittsburghers enjoy growing our own food? “Are you sitting together?” the cashier had asked about me and the blond gentleman behind me, who is now getting his take-out order. Other businessmen and women come and go while I stare at the Trip Advisor Certificate of Excellence sign and wonder if the contents of the “Death by Chocolate Biscotti” jar on the counter are worth it. The hum of the AC and drink coolers blend with the nearby conversation, clatter of plates and kitchen sounds, drowning out any sign of Penn Avenue traffic. A waiter asks another guest, “What kind of aioli did you want on that?” My sandwich is larger than my appetite, and he cheerfully brings me a box. Supporting local businesses is how I rationalize spending thirteen dollars walking home, a short journey I begin with the goal of saving $2.75 on bus fare. The two tanks from the dollar store can’t count, even though the brand name is catchy and grounding: “Just Be.” This is hard to do when the sun is beating down like it's Tijiuana again (is it the music from Casa Reyna? ), but then maybe it's helpful that my brain is bringing up memories of similar situations, sweating in jeans in a construction zone, reminding me no matter where we go, people are always thinking about how to make things better. Today's crews are filling a section on Penn; another is finishing an office space on Liberty. No, I am not equating plywood houses and hammers to cement work, hardhats and backhoe favors. My course today weaves through reflective safety signs. Better is how I feel after stopping in a couple more places to appreciate their product (and air conditioning). BoxHeart Gallery is showing a stunning collection of oil paintings: cleverly-titled portraits of people feeding parking meters draw me first into a comical reflection before the room wraps similar themes around three walls. Forget Port Authority, William DiBernardi's observational realism transports me to whenever we will look back and laugh at how silly we are, engrossed in our devices—or just documenting their novelty, foretelling our grandchildren’s wonder at what it was like to know the world both before and after smart phones. There will never be another generation to experience this. A purple sheen next captures my eye, and I flirt with the idea of purchasing a tall, elaborately crafted ceramic vase. After exclaiming and asking the gallery attendant a few questions, she explains the wood-fire process. I tell her I will recommend this to friends—go, please, before the exhibit ends on Friday September 22: BoxHeart Gallery on Liberty. They have jewelry and other handcrafted gifts too. 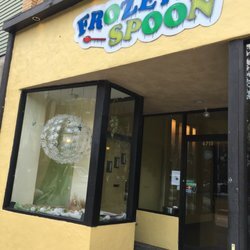 My next stop is Frozen Spoon, where I’m again the only patron—but a satisfied one, thanks to a blend of tart and chocolate yogurts topped with vitamin C (via mango, kiwi and strawberry). I know I’m not the only one who enjoys this West Coast treat’s migration, but sometimes I worry, given the closing of Frozen Spoon's predecessor, Oh! Yogurt. For three dollars you can sit in the glow of white lanterns and eat more fiber in one dessert than most Americans do in one day—sorry, another exaggeration—but really, it's nice. Next time I’ll remember to take a photo for Instagram before destroying my elegant creation. Date night? Sep 24 Tecmo Super Bowl vs NFL 2K5 Poll: Which is the Best Football Video Game Ever?